Figure 1. Sinking in dreams of a black sea of ink. The aesthetic challenges of creating massive ink traces can be likened to passing a withered suspended bridge stretched between two mountain peaks piercing through clouds. Large scale calligraphy will test your sense of balance, awareness, coordination of body and mind as well as challenge your artistic vision. I have written many large calligraphy works, but, I must say, when I entered the hall of the Hakuhousha Calligraphy Exhibition (白峰社展覧会, はくほうしゃてんらんかい, Hakuhōsha Tenrankai) I was blown away. 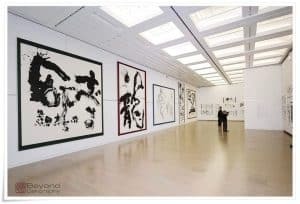 The expressiveness and raw power of the brush strokes combined with the size of some of the works made me want to own a living room, one with a significantly larger wall. Figure 2. 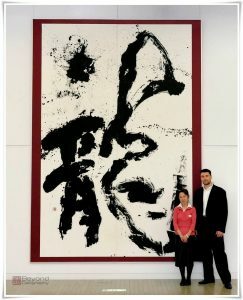 Dragon (龍, りゅう, ryū), calligraphy by Master Shindō Suihō (進藤翠萌, しんどうすいほう), pictured with my humble self. 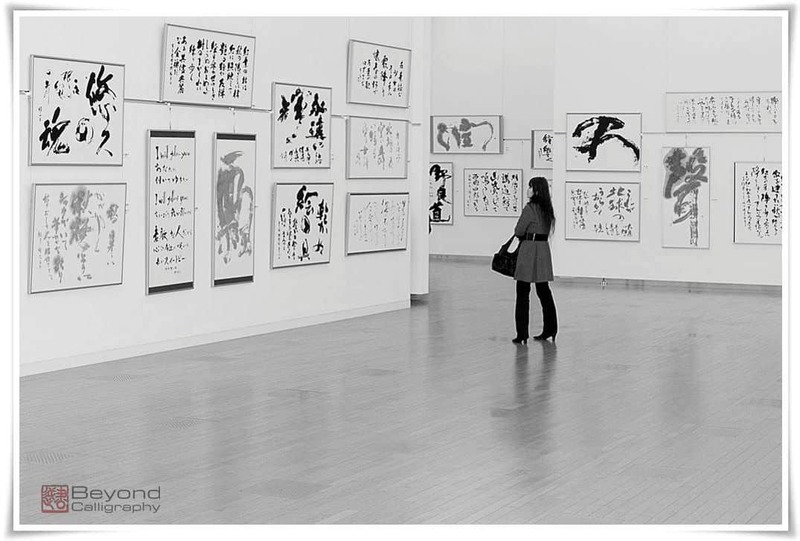 The exhibition was held in the National Art Centre of Tokyo in December 2011, the same venue as the exhibition of All Japan Calligraphy and Literature Association about which I wrote an article only a few weeks ago. 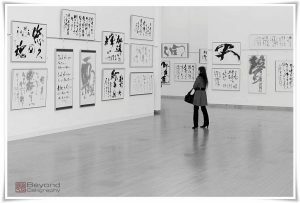 Hakuhousha was a combined effort of calligraphers from a few different Japanese calligraphy organisations. The atmosphere was absolutely electrifying. Looking at Figures 3 and 5, you will notice that the theme of the event was modern calligraphy. Displayed art seemed to me to be artistic photographs, rather than brush works, characters “written” with a black or grey powder stirred up by a violent wind and randomly exploding all over the walls. I felt as if I were standing in the eye of a cyclone paused in time. Mad lines, creations of a completely free mind, shapes shifting like clouds on a stormy sky, drawing dramatic and very exciting scenery. I became so enthralled that I forgot to take photographs. 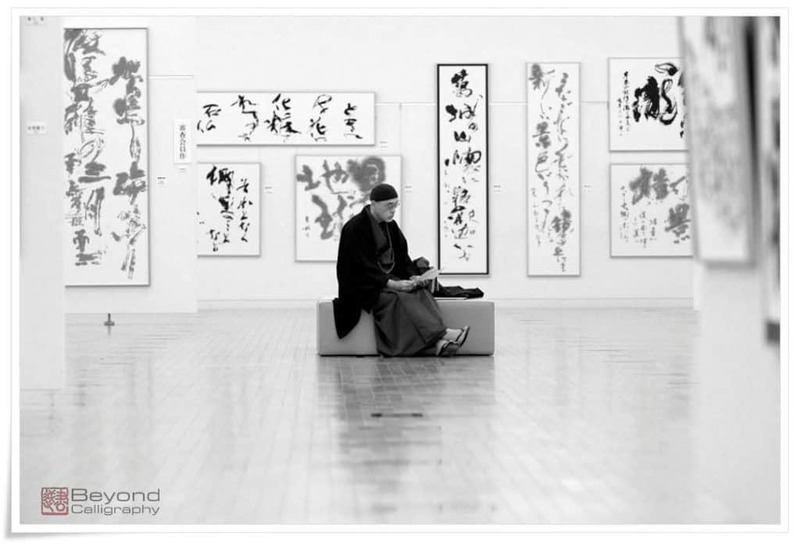 Fortunately, Dave Gosine, co-founder of Beyond Calligraphy accompanied me and kept shooting. Figure 3. 空の石盤に鷗がABCを書く (そらのせきばんにかもめがＡＢＣをかく, sora no sekiban ni kamome ga ABC wo kaku, i.e. “on a sky slate a seagull is writing ABC”). 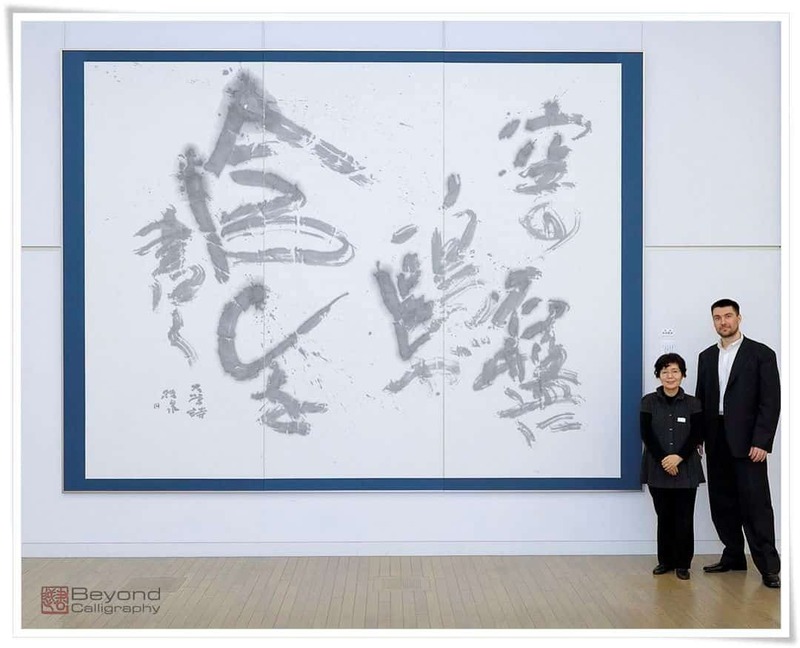 Calligraphy by Master Ueda Seikan (植田凊寛, うえだせいかん), also pictured with my humble self. Although not all of the works displayed in that exhibition were huge, I wish to focus solely on the giant pieces. If you have never been to Tokyo, you may not realize how insane of a concrete desert of confined space it really is, choking us slowly with its arms of permanent tension and mindless rush, stripping us of any privacy. 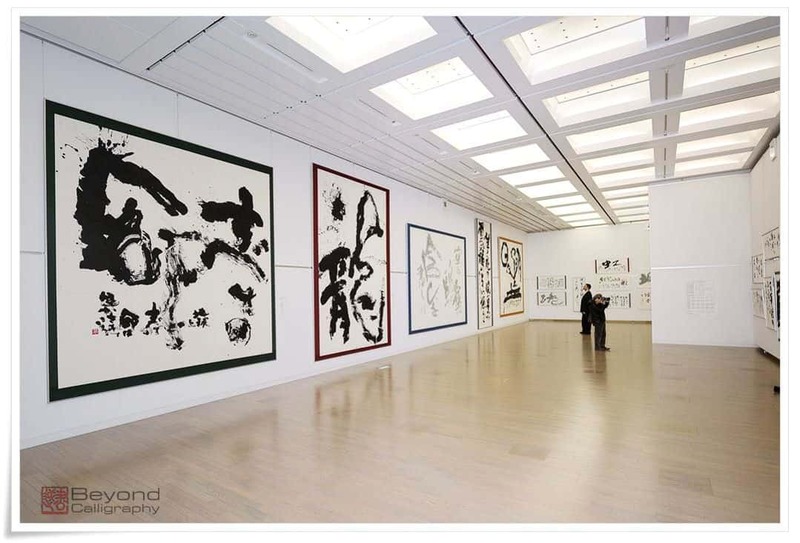 Visiting this exhibition was an enormous breath of fresh air, a truly relaxing and mesmerizing experience. Figure 4. It was refreshing to see the younger generation enjoying the art of calligraphy. A rare sighting indeed. I do not carry a watch. I simply hate having things attached to my body, and I am so absent-minded that I would most likely forget that I had one and would not know what time it was anyway. In Figure 1, you can observe the phenomenon known as “Ponte Ryuurui (品天龍涙, ぽんてりゅうるい, Ponte Ryūrui) lost in time”. Using this piece as an example, I wish to illustrate one important thing. 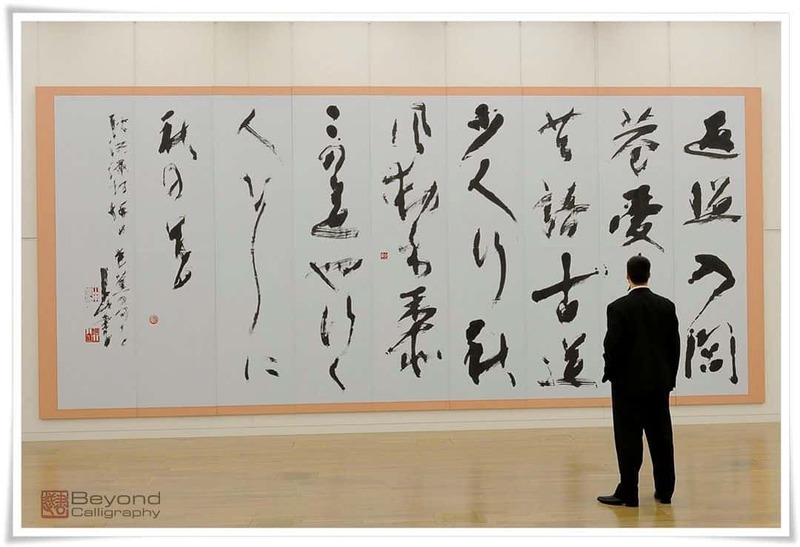 Westerners, when observing a Far Eastern calligraphy, often say that they wish that they could read what is written. I wish to tell you that that is not always so important. As I wrote in a recent article, instead of focusing on the content, lose yourself in the energy. When I stood in front of this magnificent work, I totally forgot where I was, who I am and that I had to go back to work on Monday. All became irrelevant, only the work was present I felt bound to it, like a child attached to his mum by the umbilical cord, utterly dependent and biologically related. I was so entranced that I forgot to ask Dave to take a photo of the label which documented the calligrapher’s name and what was written. Researching while writing this article and trying to find that information, suddenly I realised that it is not crucial. I would forget it anyway. Dates, details, etc. are things that your memory erases. But the emotions and feelings evoked by this work will in this form or another, prevail and will knock at the doors of your mind for the rest of your life. Figure 5. I like this picture too much to describe it. I will leave it up to your imagination. The calligraphy shown in Figure 2 reads “dragon” (龍, りゅう, ryū). Despite it having been hung deep into the exhibition space,, it was already visible from the reception desk. This piece is one of the largest works I have ever seen. As was the case with the work in Figure 3, we were fortunate to be able to meet the artists of both works and took pictures with them, in order to show to you the scale of those mammoths. A brush needed to write a work of this size soaks up about a litre of ink at one go. To give you some comparisons, it takes me approximately 12-15 hours to prepare 0.5 litres of ink, and I use an ink grinding machine that is capable of rotating two ink sticks at once.. This work must have taken an insane amount of effort, but it was well worth it. The effect is excellent and the dragon is powerful and dynamic. Figure 6. 波 (なみ, name, i.e. “wave”). 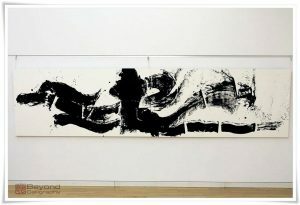 The insane ink wave by Master Anabuki Hōgo (穴吹放牛, あなぶきほうご), modern calligraphy piece. The work in Figure 2 is quite unorthodox, it merges Chinese characters, Japanese kana (かな), and the Roman alphabet. It reads: 空の石盤に鷗がABCを書く (そらのせきばんにかもめがＡＢＣをかく, sora no sekiban ni kamome ga ABC wo kaku, i.e. “on a sky slate, a seagull is writing ABC”). I really love the lightness of ink symbolizing the sky and the fluffiness of clouds combined with the expressive randomness of the path of a seagull in flight. Figure 6 shows my favourite out of all of the work that we documented. It reminds me of the Copernicus theory, the one in which he stopped the Sun and moved the Earth. A calm centre in the chaos of an ink storm. It’s a definitive contrast, peace and tranquillity dressed in traditional winter kimono coloured in dark grey tones with all surrounding artistic madness. Figure 7. Partial view of the exhibition hall. 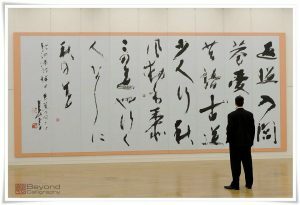 Calligraphy in Figure 6 spans the traditional cursive script (草書, そうしょ, sōsho) and avant-garde calligraphy (前衛書道, ぜんえいしょどう, zen-ei shodō), wherein legibility is the key. The character is 波 (なみ, name, i.e. 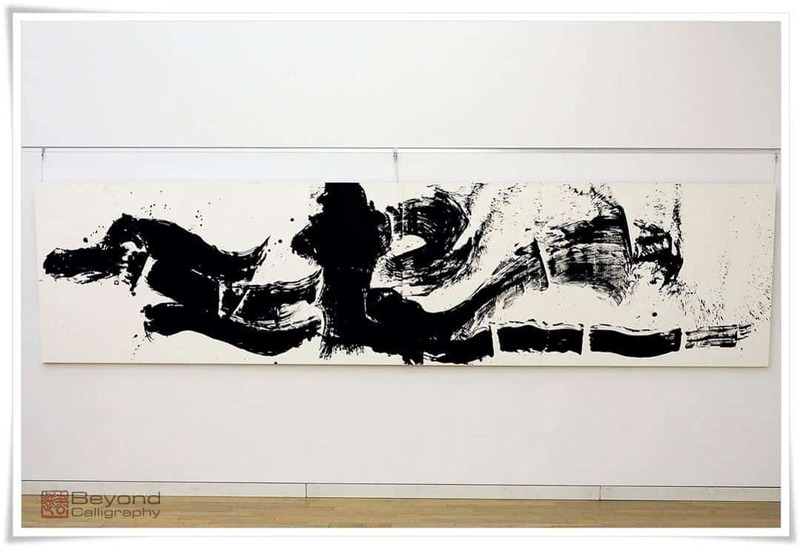 “wave”), though it was titled “insane black wave”. I look forward to upcoming events by this group of calligraphers. Life in the most condensed metropolis of the world is not the easiest, but exhibitions such as this make it all worthwhile. Thank you for reading, Steve. This exhibition was fantastic. In fact there were 4 exhibitions happening at the same time, with over 4000 pieces being displayed. It took us two days to see them all.